All the best shells and accessories, all at one location, for you to compare side by side! Since Adirondack Rowing began its business in 1970, we made the decision to provide the highest quality educational, informational, and instructional services for new and experienced scullers and rowers. We have kept to that commitment without fail. We have found, in every one of those years, that prospective and experienced scullers truly need a high quality rowing and sculling educational and instructional service before they consider purchasing a new or used rowing shell. All scullers who understand the importance of a quality educational and learning experience become happy, injury-free, lifelong scullers. Our emphasis on the highest quality educational approach has resulted in our being the oldest and best full-service rowing shell dealer on the North American continent. Since our first sculling lesson in 1970, we have delivered unparalleled new and used rowing and sculling products for open water and racing shells. We also offer the planet’s largest rowing shell rental program as well as premium, high-quality, individualized, sculling lessons for all levels of sculling. In fact, Adirondack Rowing was the first and remains the only company to have the rowing shells we offer and instruction on the same shoreline. No other full service dealer exists with such high quality services that we offer to the rowing community. The best premium quality sculling lessons at the most affordable rates in the rowing universe! We consistently and without fail provide our customers with premium individualized instructional sessions at affordable prices that includes value added items. Check out our Rowing School page! The largest full collection of open water rowing shells and traditional rowing boat hulls on the market today. All in one place for rowers to compare all at the same time, all at the same location. Pre-Winter Sale – Huge selection of Alden Ocean Shells available! Call or email us for the listing. Click on the picture to see our list of gently used rowing shells! Click here to check out our new listing of gently used boats! Follow Us on FaceBook and Connect With Us on LinkedIn! No one, guaranteed, will give you a better overall price plus essential extras, has a larger selection of rowing shells, or will treat you as well as we do before and after your purchase. What Boat Should I Buy! How do I place my order!? Our totally new and improved Adirondack Boat Dolly is available! Find out the best way to move a boat around on land. Email or call us about it! Attention New York State Residents! Did you know that we pay your New York State sales tax for MAAS, Alden Echo, and WinTech shell purchases? Saving 7% sales tax can make a big difference! Did you know the Canadian Tariff Classification of a shell is 8903.99.10? You can import a rowing shell into Canada duty free if it is made in the USA. If you have purchased your rowing shell elsewhere and you find that you need or would like expert instruction that won’t cost you a lot of time and money, Adirondack Rowing has the best and most efficient rowing day classes in the rowing industry. Lowest guaranteed overall package price. $100.00 referral fee with every new rowing shell package sale for each and every rowing shell package sale for life. Being able to review and demo the largest selection of shells located all in one location. Unbeatable and hands down the best customer service you will ever have now and into the future. Great Adirondack Rowing T-shirt, 100% heavyweight preshrunk cotton, to wear while rowing! Is it time to move your shell from your winter home to your summer home? Did you purchase a shell and need to have it transported to your home, lake front cottage, or to your club? Our drivers transport rowing shells all along the Eastern Seaboard from Maine down through Florida and into the Mid-West. Did you have a mishap and hit that partially submerged log in the lake? Did a tree fall on your shell during the last storm? Or maybe the neighbor’s son used your shell as a riding toy? If so, give us a call or send us an email to see if we can help you out. Are you looking for a drop in sculling system for your boat or shell? 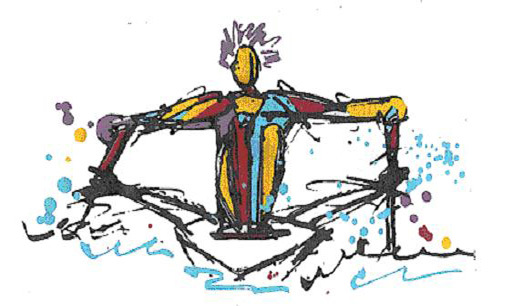 Click on the pictures to learn more about each drop in sculling system. 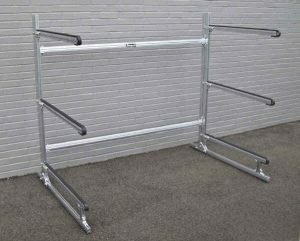 Does your boat need a storage rack at your club or do you need a storage rack for your home or lakeside cabin? Check out these boat storage racks! We are the only company to provide customers the MAAS Aero, MAAS 24, Alden Star, Alden Ocean Shell Single & Alden Ocean Shell Double, WinTech Explorer 21 & WinTech Explorer 24, Adirondack Guideboat 15, Adirondack Wherry, the Echo, and a large number of other shells all in one location! We have found that the sliding seat Guideboats and Wherries out perform most open water shells in rough water in performance & versatility. Adirondack Rowing is the world’s largest provider of new and used rowing shells and sliding seat touring boats. Since 1970, we have provided access to only the best quality shells and rowing products. In fact, we have taught more scullers and sold more shells than almost anyone else, including manufacturers. We deliver our customer’s shells more efficiently and safely than anyone else. We remain totally committed to bringing you the best equipment in the quickest and most cost effective way possible for over 40 years. 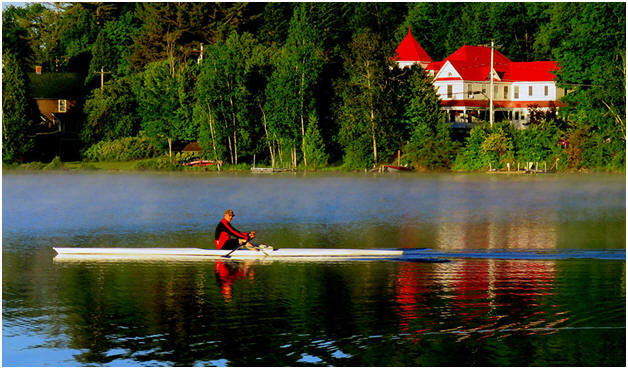 Our rowing school has been providing great sculling instruction for over 40 years, specializing in high-quality, and efficient one to one instruction. Our expert instruction ensures our rowing school is full of happy scullers spring, summer and fall. Our mission is to provide high quality private instruction to allow rowers, who have limited time, to replace week long rowing camps. Adirondack Rowing offers rowing shell, Guideboat and Wherry rentals from dawn to dusk, 7 days a week, at our location or yours. Enjoy the beauty of an early morning row while on vacation in the Adirondacks with a rental of a boat or two. We are able to provide a variety of shells, Guideboats and wherries for rent along with delivery and pick up if necessary. One-hour rentals to multi-day rentals are available. A peaceful morning at Saranac Lake as experienced by one of our rental customers. Custom Built Wooden Boats Available! We want to thank all of our great customers who have been such a support to us over our 40+ years of business. This support has allowed us to continue to bring the best open water shells, wherries and Guideboats to your shorelines for enjoyment. we are also the first Yakima and Thule roof rack dealer on the Internet! Since we opened our doors in 1970, we have been, and continue to be, very proud of our unparalleled customer service and our motto to treat others as we would want to be treated. Over the years we have received unsolicited letters, emails and phone calls, all with the nicest words from our customers, as well as some from people who were not our customers! We always respond to our customers with our appreciation, as we are very thankful of these kind words. On our testimonial page we proudly post these phone calls, emails and letters for others to read so they too will know about the high quality of customer service we stand behind here at Adirondack Rowing. Please click here to read what others have written about our customer service. I just want to let you know that Bill, Dave, Grigory, and I all had a wonderful time rowing from Long Lake to Ampersand Bay in your Adirondack Guideboats last week. We greatly appreciated the care you took in explaining everything we needed to know about the boats and wheel-a-weighs, providing us with a repair kit (which did come in handy for retightening some bolts along the way), and instructing the novices in the basics of sculling. Please also extend my thanks to Karen for her patience in answering the many questions I had before the trip. M. Schleier, PA.